Analysis | Product Development Associates Inc.
We primarily use two different software packages for our analysis work. NASTRAN is typically used for our linear static and dynamic problems while EMRC is used for thermal and nonlinear structural situations.Our analysis capability can save you time and money by giving you quick and accurate answers to complex problems early in the development process. 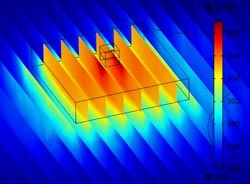 A simple example of thermal testing analysis. Units we test are often made of many components with different thermal tolerances and reactions.